The Abia State chapter of the All Progressives Congress(APC), has pleaded with the abductors of Hon. 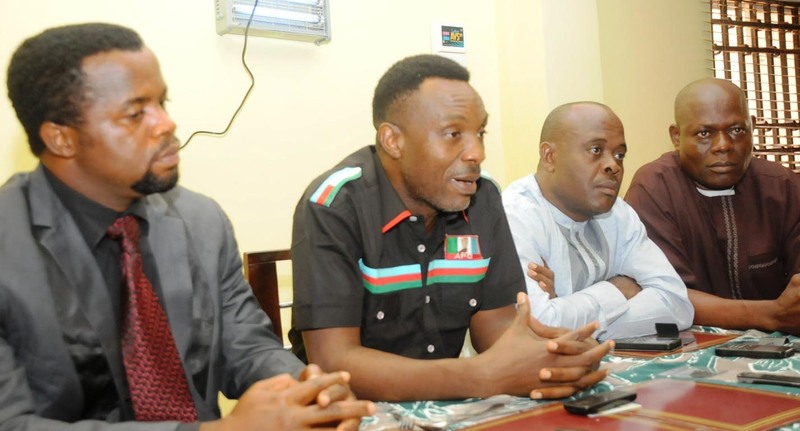 Donatus Nwankpa, the state chairman of the party, to release the ex-lawmaker unconditionally, to enable the party continues its strategy ahead of the general elections. The Publicity Secretary of APC in the state, Comrade Benedict Godson, made the appeal at a press conference held in Umuahia, the state capital on Thursday. He explained that the whereabouts of the APC chairman since Monday night, remain unknown, as it could not confirm if the kidnapping has political undertone. DAILY POST had reported on Tuesday, that the police command in Abia confirmed the abduction of Nwankpa, on Monday night. The Police Public Relations Officer, SP Geoffrey Ogbonna, told newsmen that the command was aware of the incident. The APC spokesman, who was flanked by some members of the State Working Committee(SWC) during the interaction with newsmen said, â€œWe are pleading on the abductors to release our chairman for us. Right now, we are not accusing anybody, because of, who Hon. Nwankpa is. He is a good man,a good leader who moved this party(APC) from nowhere to somewhere today. â€œHon. Nwankpa is a man who is being loved by all. We believe he will return safely. We are pleading to whoever or anybody that kidnapped Hon. Nwankpa to release him to us. â€œWe donâ€™t know if the abduction, has political undertone. We are only asking for his unconditional release. Again, one of his aides, was actually kidnapped alongside with the APC chairman.